Author Payment Bonus is an addon for Post Pay Counter that allows you to manually award a bonus to writers just before paying. This is ideal if you would like to personally tweak the payroll, giving authors a little reward (or even decreasing their total payment). Just before paying, in the Confirm payment page, a new Author Bonus field will show up and allow you to give each writer a custom bonus, which can be either positive or negative. The addon works both with the plain mark as paid feature and with PayPal payments. 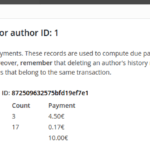 The custom bonus will be logged in the payment history and be displayed in the transaction log, so that users will know whether they have received a bonus. First of all, make sure you have the latest release of Post Pay Counter and Post Pay Counter PRO installed and active. 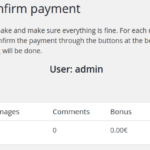 As soon as you purchase the addon, you will get an email with the download link and your license key: download the plugin through that link, extract the zip and upload its content (the whole ppc-author-payment-bonus folder) to your WordPress wp-content/plugins folder. Now head over to your website plugins list page, look for Post Pay Counter – Author Payment Bonus and activate it. Finally, go to Post Pay Counter > Options > License status, paste your license key in the apt field and hit Submit. You’re done: your license has been activated and you can now enjoy all the new features. We are always here to help you! And guess what: we always take extra care of our dear PRO users. Drop us a line anytime and we’ll help you as soon as we can (we are based in Italy, so expect some delays due to time zone differences)!